So earlier this year I decided to write an app for the iPhone. In my case I wanted to loose a little weight before working to add on some muscle for a planned summer trip. I’d not been particularly happy with anything I found to track my weight before, so I decided to write my own. Thus was born Better Weigh. Just normal changes from diet, exercise, and other activities can cause your weight to vary by several pounds per day. These daily swings make the real changes over time of your weight hard to track. Better Weigh smoothes out these variations showing you how your weight is really changing and helping you reach your goal. You can enter your weight manually or sync with FitBit. More syncing options are planned. 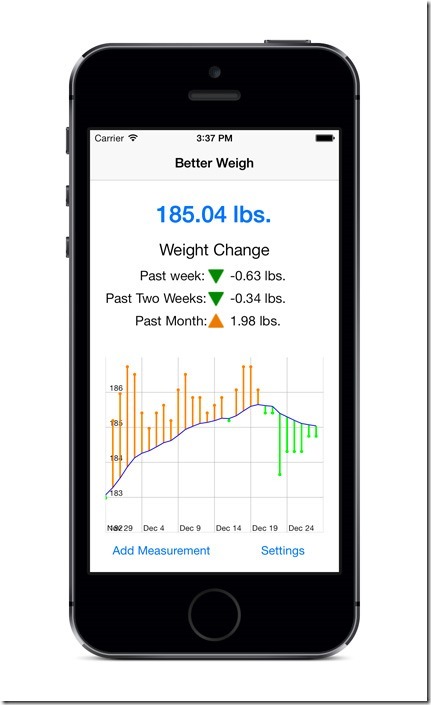 You can find it on the App Store or see more info at http://betterweigh.me. Every iPhone release seems to bring some kind of debacle varying from real to merely a search for clicks on the web by writers. The commentary usually starts with the normal “Apple is finally losing it” to “Apple can do no wrong” and then somewhat sane reality comes in. The iOS maps debacle, which is an iOS issue and not an iPhone issue, looks to be the most valid and worst of them. I’ve followed this one with some interest as I’ve planned to upgrade to the new iPhone. The issue was driven home a bit to me over the weekend. I was in the northern part of the Cumberland Plateau in Middle Tennessee Sunday looking for two places. One was a place that I’d last visited in my college days and the other one I’d only read about. Along with me were some directions and notes. Neither was a spot you could just plug into a GPS and get directions which admittedly is my normal way of getting somewhere now. The first spot I found with no problems between good directions and vague memories. It was in fact a more lovely location than I remembered. The second I never found though I drove within a few miles of it. The reason, my directions left out a single turn, a short trip of less than a quarter mile, that meant I never saw the road I was searching for. As a result eventually we gave up and had to abandon the quest for another day. While driving back home I thought back to when several years ago I learned that at least one major GPS had a mistake on the addresses on the street where I live. The street is a circle, a short loop of about thirty homes. That brand of GPS, or more exactly the map provider they used, had the addresses backwards so that if you followed them you’d likely end up exactly on the opposite side of the circle from where you actually meant to go. In the daytime this was a minor issue since the address numbers on the home would tell you that you were in the wrong spot. At night where these numbers were invisible, it wasn’t so clear. More than once someone I’d provided directions to my house wound up knocking on the wrong door or realizing something didn’t look right and calling me while from the street. It’s how I learned there was a problem and for a while I always added the warning when someone visited the first time. Both of these had the same basic issue. Bad data. The GPS data was beyond my control and I did the only thing I could do, warn visitors not to trust the address on their GPS. The never found place on Sunday was my largely my fault. I could have checked or verified the directions before I left or at least checked a map well enough to have realized something was off in time to get to the right spot. In both cases though the data I had failed me. The first time I remember using a computer map system to find directions to a place I’d not visited before it told me to use a bridge that no longer existed to cross a river. On a trip in Kentucky a couple years ago a road under construction and not in my GPS caused it so much confusion my GPS actually crashed and had to be restarted. A construction project I drive through several times almost every day has shifted the entrance and exit patterns to a shopping center, college, and mall several times in less than a year and will do so several more before being complete where the pattern will be completely unrelated to the original one. And that’s the problem Apple is facing with maps. Map data is often inaccurate. Even good data is often behind. It’s so much easier to travel now with GPS data and maps available on demand on your phone. I’ve learned the art of interpreting the GPS, trusting it enough to get me there, but also expecting it to be wrong at times and using common sense. It doesn’t really matter where it might be wrong because it will always be a little wrong somewhere and each time I or someone I know gets wrong directions that will be reinforced. I’ll probably take a long time before I trust Apple’s maps to get me there which might be the biggest problem they face now. Apple has to make maps that work not as well as Google, but better and for long enough that everyone forgets how bad a start they got off to. By the time IOS 6 likely comes out in the fall I’ll have been using IOS for two years. Overall I enjoy my iPhone and iPad in spite of the occasional quirks. No technology is perfect and I’m too much of a technically minded user to ever completely like any system that I didn’t create. With IOS 6 likely to be announced soon, I thought I’d throw my two cents on the changes I’d like to see in the next version of Apple’s mobile OS. Many of my annoyances with IOS would go away with this single change. I’m not talking about a full file system access to everything on the device, but just a single document area that all apps can access. I want to be able to create a file in QuickOffice and be able to edit it in Pages. I want to be able to save a file as a PDF in one app and then read it in GoodReader later. The independent silos where all apps are self contained mean I often have the same file on my device multiple times. I think this is the biggest obstacle to using the iPad as a creation device. Another thing a centralized document system would allow are easier email attachments and multiple attachments to an email. Imagine being able to email two photos at the same time to someone. With IOS an icon generally tells me nothing other than I can tap it to start an application. I can get a number, but a single number can only tell you s much. It’s useful for how many like unread messages or voicemails I have, but tells me nothing about who sent those messages or called. Microsoft is doing this right in Windows Phone and Windows 8. The weather apps shows me at a glance if I need my umbrella that day. The sports app shows me who won last night. I’d love a small block on my iPhone to show me these things. When I’m busy let me find what I need and go. Why does every developer have to write DropBox integration into their App? Give an interface that app developers can write against and then let DropBox, SugarSync, Google Drive, and everyone else write their own handler of that interface. If I want to use Microsoft’s SkyDrive to store my files, I don’t want to worry about if the developer chose to integrate it. Let Microsoft write an implementation of SkyDrive and then every app instantly supports it. This would work for so many things. Let’s say I have a program to manage my photos on my device. I use 500px to post my photography, so why not a search interface that let’s me search for photos there just like searching for photos on my device? The integration options would really open up apps to the world. I really don’t need or want two folders with the same name because I have one more than the limit Apple decided I should keep in one. There is no way that having Games 1 and Games 2 makes sense. Let me put more things into a folder or even better let me put as much as I want into a folder. I’ve always wanted a unified communication point. I want all my email, text messages, even phone calls and voicemails in one place. I want to see Facebook updates, RSS updates (yes I still use those), Google+ posts, and tweets there too. Tie this in with the connectors mentioned above so that anybody could make their service available to the hub. Bring my digital life to a centralized point and let me choose what I want to see at a given time. If I’m meeting someone for dinner I may want to just look for any texts or emails from her or for a tweet about being traffic letting me know she’ll be a little late. If I’m coming back from a week’s vacation in the mountains, I want to see everything work related from the last week, but only from co-workers. I know this one has zero chance of happening, but it’s just an annoyance I’d like to see go away. Apple seems determined to make sure nothing happens on the device where Apple doesn’t get it’s 30% cut. Want to buy a book for the Kindle App? Have to go to the web site as Apple’s rules would require Amazon to give Apple a 30% cut if it could be done there. This simply makes my life less convenient and isn’t making Apple any more money. Vendors have overwhelmingly shown that they’ll just remove the functionality to purchase in app and rely on their customers to find them somewhere else. And it’s working. I don’t use iBooks because it’s more convenient, I use Kindle because it’s what I want. My audiobooks come straight from Audible. That’s my wish list for iOS 6. Anyone else with requests?